It seems the mattress company known as “Sleepy’s” commissioned a survey to find out which jobs were associated with the least and the most sleep. 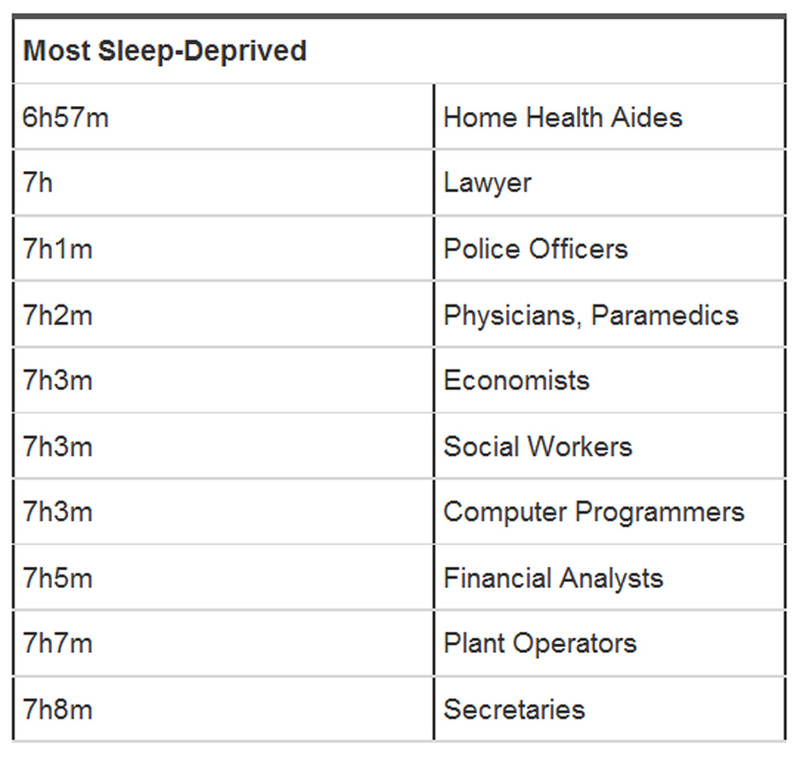 You could probably name a few of the occupations that cause people to be sleep-deprived. But some were surprising. 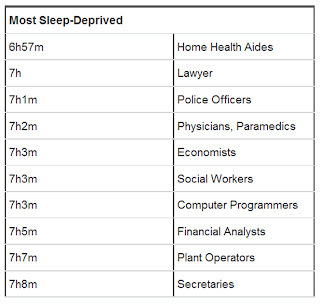 Here they are with the amount of sleep claimed by people in those jobs. Are you buying this? Home health aides? I can’t resist the urge to point out that they may occasionally catch a few winks on the job. Lawyers? Too many jokes to fit into a blog of fewer than 500 words. Economists? If they’re up at night, what are they doing? Certainly not fixing the economy. Maybe they are talking to financial analysts or secretaries. Alert the Nobel Prize for Economics Committee. The Times report said that over 27,000 people were interviewed. They were asked about the average number of hours of sleep they got and what they did for a living. Could it be that the estimates of sleep were flawed? How many hours of sleep did you average last week? The time difference between the amount of sleep stated by the #1 most sleep-deprived home health aides and that of #10 secretaries was 11 minutes. The statistical significance of the different times can’t be stated because we don’t know how many people were questioned in each job category, nor do we have the mean times and their standard deviations. Even if there was a statistically significant difference, is an 11 minute difference a clinically meaningful one? Oh, there’s one other thing. Ranked at #8, #9 and #10 on the list of those who get the most sleep are engineers, aircraft pilots and teachers. Their average amount of sleep was 7 hours and 12 minutes, a whopping 4 minutes longer than secretaries, #10 on the list of the most sleep-deprived. Bottom line. This survey is to research as hot pockets are to gourmet food. Research finds that air contains bacteria! Why I am I so grumpy?